After hours of research and experimentation, and having examined the most popular 14 of them, it became clear to us that the Cuisinart 14 Cup was the top of the food processor pile. It has the versatility to cover a wide range of processing requirements, it has huge capacity, powerful motor, long warranty... and it's much cheaper than other options in our top 5. If you are tired of preparing all of your foods by hand, slicing and chopping vegetables, grinding up seeds and nuts, shredding and grating cheeses, or mixing dough, then you’ve likely considered a food processor. With these machines, you can save yourself many hours of cooking time and worry in the kitchen. What better way to enhance your cooking experience than with a quality food processor? The only issue is, if you aren’t sure which food processor to buy, the options on the market can be quite daunting. In this article, we’ll take a look at the top 5 food processors currently on the market. And with this handy guide, you will be more able to determine which food processor is the right fit for you. While you have many options to choose from, we’ve narrowed it down to help you find the perfect machine to aid your cooking! 1 How Do We Rate Food Processors? 2 What About the Cheapies? How Do We Rate Food Processors? When it comes to determining which are the best food processors on the market in 2018, how do we go about it? In measuring the best food processors we use a set of five criteria. Given these criteria, what are the best food processors in 2018? Let’s take a look. With an MSRP of $199, the Cuisinart DFP-14BCNY 14-Cup Food Processor is by far the best processor on the market for the price. Both #3 and #4 on our list will cost you significantly more, but they don’t exceed the overall performance of this model. Cuisinart is an established company known for its quality products, and this model demonstrates why they have such a tremendous reputation. For reputation among users, performance, and price, the DFP-14BCNY outshines all its competitors on the market today. At the heart of this model is a powerful 720-watt motor. That’s powerful enough to cut through even the densest and thickest of foods. There should be no doubt that this motor can handle even the toughest foods you might put in it. The motor is a little over half the power of the #4 Breville model on our list (which is the most powerful one we’ve reviewed). However, even though the Breville is much more powerful, you will hardly notice the difference. Both machines tear through food with ease. Cuisinart has also equipped this model with an extra large feed tube. It is large enough to fit many whole foods like apples and oranges and bunches of longer foods like celery, without any trouble whatsoever. It is nice to know that you will not have to do much prep work chopping up food in order to use the food processor. All the food processors on our list are capable of handling large foods, so you can be sure whichever model you’re looking at will be able to process whole foods. At 14 cups, the capacity of the bowl is also large enough to handle larger sizes of foods at one given time. The only model larger than this is the 16-cup bowl that comes with the #4 Breville model. There is no need to piecemeal out your food preparation. With the large feed tube and the large bowl, you’ll be able to handle everything at once. The DFP-14BCNY comes with three separate discs for three separate purposes. You get a slicing disc, a chopping blade, and a shredding disc. This will allow you to prepare all the different varieties of foods you want. There is no need to use a different machine, since you have the right tool for almost any food preparation tasks. The blades are stainless steel so there’s no need to worry about rusting. And all the parts are completely dishwasher-safe. This makes it much easier to clean up and keep the machine in good working order. Other models, like the #2 Braun on our list, will come with more blade/disc options, but the three combined blades of the Cuisinart are more than sufficient for most uses. The model comes with seven separate food preparation functions that all work at the simple touch of a button. These control options are far greater than the simpler “on/off” function of the #4 Breville model on our list. The Cuisinart also comes with recipe guides to give you ideas and greater options on how to use it efficiently. Cuisinart also offers an impressive three-year warranty that covers any manufacturer errors. Most other models on our list, like the #2 Braun and the #3 KitchenAid, only come with one-year warranties. Cuisinart has an excellent reputation for service to their machines and will back up their warranty with excellent customer service. Though no company is perfect, Cuisinart has an excellent reputation for handling customer complaints. 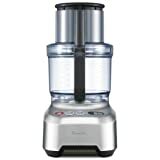 If you are looking for the absolute best food processor for the money, the Cuisinart DFP-14BCNY is our recommendation. Cuisinart‘s 14-Cup Food Processor reigns supreme in my kitchen. So much so that it was the sole food processor I used to create and test the 100+ recipes in my cookbook, and it’s the only one I recommend. It has the power to process trickier ingredients and the endurance to whirl for the long haul, which is a major perk if you’re wanting to make homemade nut butters, coconut butter, etc. With the same $199 MSRP as our number-one pick, number two on our list is the Braun K650. This means that price-wise, #1 and #2 on our list cost the same. This model comes packed with more accessories than the Cuisinart model that topped our list. These extra accessories give you more options and a wider variety of food prep activities. This model can process more foods faster because of its versatility. But this added versatility can also be a downside, which is why the Cuisinart beat it out for the first spot. The Braun, while it will give you more options, can also be more cumbersome in the kitchen. For this reason, #4 Breville and #5 Black & Decker on our list come with handy storage containers, unlike the #2 Braun. Having to find a place to store all the additional accessories is somewhat of a disadvantage for this model. Furthermore, it only comes with a 600-watt motor, which means it won’t pack quite the same punch as the Cuisinart. However, the selection of blades provided with the Braun will allow you to grind down hard foods fast, or slowly churn and shred cheeses without any difficulty. Where this model really stands out is the variable speed dial supplied. In contrast, the #1 Cuisinart only has predetermined speeds according to its settings. With this dial, you can manually control the rotation of the blades anywhere from 300 RPM to 2,000 RPM. This can be somewhat difficult if you are attempting to chop foods; however, most people will find the added control a great benefit for customizing your food preparation. The K650 comes with a slightly smaller bowl than the Cuisinart model. However, the nine-cup capacity should be more than sufficient for most situations. While you will get more food into the Cuisinart model, the Braun should more than handle most applications. In contrast, the #3 KitchenAid model comes with a 13-cup bowl, much closer to the #1 Cuisinart. Another reason that the Cuisinart beat out the Braun for our top selection, is that the Braun can be somewhat difficult to clean. If you are processing soft foods like cheeses, they tend to stick to the blade and get stuck under the rim, which can be difficult to get clean. For this reason, you may expect to spend additional time (up to 15 minutes), just cleaning the Braun after use. This will, of course, vary depending on the food and conditions at any given time. The components are dishwasher-safe, so that may help eliminate some of the extra cleanup time. Braun provides a one-year limited warranty with this model. That is not quite as impressive as the Cuisinart, but with few customer issues, it should more than cover any problems you might have. The Braun K650 is great for people who want more options than the Cuisinart model and who don’t mind dealing with the extra cleanup and organizing accessories. With an MSRP of $229.99, the KitchenAid 13-cup “ExactSlice” blend comes in #3 on our list. It costs only about $20 more than the #1 and #2 models on our list. This machine fits nicely in between the previous two with its cup size, which is almost as big as the Cuisinart, but it comes with a motor of only 360 watts. This makes the KitchenAid ideal for larger jobs when you do not need the extra power of the Braun or Cuisinart. Ultra Wide Mouth Feed Tube accommodates tomatoes, cucumbers, and potatoes with minimal prep work required. Like the Cuisinart, the KitchenAid comes with three different blade options for a variety of applications, but also with two discs for soft-food processing. So the KitchenAid in many ways will give you the added variety of the Braun, but just without the same power. As with the Braun model, the KitchenAid will require some additional work to clean in order to get all the foods out of the crevices and blades/discs. However, both models give you the same issues, whereas the Cuisinart is relatively easy to clean. In consumer tests, results showed that the KitchenAid handled tasks like chopping and shredding with great ease. However, it tended to have some difficulty with foods like nuts. Because of the large-capacity bowl, these kinds of foods were found to merely bounce around rather than get processed. For these reasons, the KitchenAid is the best model for those mainly wanting to process soft foods rather than grind down hard foods. You will find that, with the different blades, you will easily process cheeses, potatoes, and onions without any difficulty. It comes with an extra-wide food chute so that you will easily accommodate whole foods. You should also note that this model is a bit louder than the other models on our list. With a rating of around 95 dB, you will not want to use this processor while others are trying to sleep! All the other models on our list are no louder than regular kitchen appliances like blenders. One great feature of the KitchenAid that you do not get with our first two processors is color options! You can have the KitchenAid in anything from standard black to blue, green, red, and more (depending on availability, of course). Like the Braun model, the KitchenAid only comes with a one-year limited warranty, but KitchenAid has an excellent reputation and track record when dealing with customer complaints. Unlike other models, the KitchenAid also comes with an accessory case to keep everything neatly organized. If you are looking for a little more stylish color out of your food processor and want a good variety of options for softer foods, the KitchenAid is a great choice. is the most expensive processor on our list with an MSRP of $399.95. However, for the extra cost, you also get the most powerful motor on our list. This Breville model comes with a 1,200-watt motor, which is strong enough to cut through even the densest of foods. And with a 16-cup bowl, it is also the largest-capacity processor on the list. The closest size down from this is the #1, 14-cup Cuisinart model on our list. So, if you absolutely need the largest bowl possible, the Breville is what you’re looking for. It comes with eight different blades and discs to cover almost any food application you might want. This is five more blades than our #1 Cuisinart model. Special discs are supplied for cutting French fries, kneading dough, and whisking. This gives you a lot of options when it comes to the kinds of foods you can prepare with this single machine. Breville also supplies a storage box to keep all these parts in. This model comes in three different colors (stainless steel, black, and red) and is made from a die-cast mold for extra durability. This is nowhere near as many options as the #3 KitchenAid, but it does give you more options. The bowls, blades, and discs are all dishwasher-safe for an easy cleanup. A simple “on/off” pulse function will allow you plenty of control over your food preparation and with the powerful motor, it can easily reduce most foods to their smallest forms in a matter of seconds. In tests, the Breville BFP800XL was able to perfectly slice mushrooms and grind almonds much faster and with a greater consistency than other models. However, with this powerful motor, there is at least one downside: it does have a tendency to mash very soft foods (like cheese) rather than shredding them. This means that it is twice as powerful as the #1 Cuisinart model. You will be able to get the consistency out of soft foods, but it will require a bit more control on your part. With a little practice, you’ll be able to get the kind of results you desire. Like our previous two models, the Breville only comes with a one-year limited warranty, though the motor comes with a 25-year warranty. This ensures that if the heart of the machine should happen to break or be found defective, you know you have it covered. Breville is known for their higher-end, quality products, so you will not find many customer complaints. If you are willing to invest a bit more money for a quality food processor, this model is an excellent choice. With all the accessories provided, a powerful motor, and a little practice, this can be a great addition to your kitchen. I love Breville products! They’re high-quality investments for my kitchen. I know the Sous Chef will last for years because it’s made with strong metal interior parts and a powerful 1,000-watt motor. It’s not going to end up in the land-fill and that’s important to me. My Breville Sous Chef has literally become my sidekick in the kitchen. It sits on my counter and gets used just about every day! I use the regular cutting blade for making everything from salsa, to frozen yogurt, to biscuit dough! The shredding disks also get quite a workout in my kitchen for shredding cheese for tacos, cabbage and carrots for coleslaw, and zucchini for chocolate chip zucchini bread! I even use my Sous Chef for making homemade mayonnaise and salad dressing! The Breville Sous Chef makes creating delicious food from scratch easy and enjoyable! 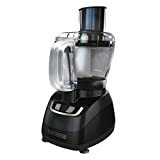 For the last food processor on our list, “simplest is sweetest.” With an MSRP of $149, you can often find this model for less than $100. This means that this model is half the price of the #1 Cuisinart. But just because it is less expensive, that doesn’t mean you’ll sacrifice quality and performance. The FP6010 comes with an 800-watt motor and two different-sized bowls (11 cups and 4 cups) to fit your application. No other model on our list gives you the options for two different bowl sizes. Black & Decker also supplies this model with three different blades and discs for different processes like the other models. They’ve also included a handy storage device to keep everything in and organize it all conveniently. Another nice feature of this model is that Black & Decker gives you the option of digital or analog controls, whichever you prefer. All the other models on our list are either digital or come with a pulse function. Black & Decker is the only model that gives you this option. If you want to simply press a button and go, the digital selections make it easy to do so. But if you want greater control over the processor, then you can choose the analog option and customize the process. With all these great features, it seems that the Black & Decker should be higher on the list! However, testing has shown that this model is the least consistent of the top 5. The model chops and cuts fairly reliably for many foods, but will often leave chunks unprocessed. In addition, it does not produce consistent grading results for soft foods like cheese. These materials often get stuck in the blades, also making it somewhat more difficult to clean. Like several other models on our list, the Black & Decker comes with an extra-wide food chute in order to accommodate whole foods like tomatoes and onions. So there is no need to break down the food before you put it through the processor. It is also not the easiest of the top 5 models to assemble and disassemble. This should be taken into account given that you will have to do this each time you use the food processor. With a little practice you shouldn’t have too much trouble, but depending on the kind of food you’re working with, cleanup can take over 10 minutes. This model does come with a two-year limited warranty, so this gives you more security than the three previous models on our list. This makes the warranty longer than both the #2 Braun model and the #3 KitchenAid model. And Black & Decker has been around for a long time with a proven track record of customer support. All the component parts are fully dishwasher-safe, so there is no need to worry about damage. 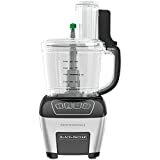 So, if you are looking for a simple, inexpensive, yet powerful food processor, the Black & Decker FP6010 is a great option. 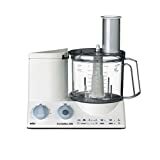 The Hamilton Beach 70740 model is the best inexpensive food processor on the market. Its MSRP is only $26.99, so you won’t have to break the bank to try out this machine. It comes with two speed controls in addition to a pulse function. Like the more expensive models, it also comes with stainless steel blades that will slice, shred or chop. It also has a strong enough motor (450 watts) to handle dense foods. That means it is as strong as some more expensive models. It will not produce the same consistency as our top 5 models, but it might be a good option for those who do not need excellent performance. All parts are dishwasher-safe. The model comes with a one-year limited warranty. This is all comparable with several of the top 5 models. If you just want a food processor for some quick food prep, this is a great option. The Ninja Express Chop is designed for small applications. It only has a three-cup bowl, which makes it the smallest container on either list. However, with an MSRP of $41.99, it is not the least expensive (though you can often find it for much less). The motor is top-mounted and only has 200 watts. This means the Ninja has the weakest of the motors. It will not handle very dense food well, and with the small cup, you can only do small applications at one time. However, the Ninja makes our list for its great convenience. It is small and compact, so it works great when you need just some quick food prep. This means it is perfect for some zests, herbs, spices, or garlic. It comes with a standard one-year limited warranty and the bowl is completely dishwasher-safe and BPA-free. If you are just looking for a quick machine to handle your small jobs, the Ninja is a great option. Number 3 on our inexpensive list is another Black & Decker model, the FP1600B. 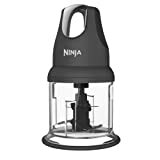 With an MSRP of $29.95, it is less expensive than the #2 Ninja model and the same as the #1 Hamilton Beach. It also has the same capacity (eight cups) and power (450 watts) as the Hamilton Beach model. What distinguishes this model is that it does not perform quite as well overall. The numerous parts are not able to be stored in the bowl, so you will have to make extra provisions for storage. It does come with some safety-lock features that other models do not have. If you are at all worried about safety, you might consider the Black & Decker. In contrast with the Hamilton Beach model which only has a one-year warranty, the Black & Decker comes with a two-year warranty. This gives you some extended time for security in case anything should happen to your machine. With these top 5 food processors of 2017 (and the top 3 least expensive models), you should be able to find a model that fits your needs. The Cuisinart (#1) is by far the best-performing machine for the money. You will find many higher-priced food processors on the market that cannot compete with the Cuisinart’s overall results. For the same price point, the Braun (#2) will give you a few more options, but with a smaller bowl and motor. If you really want power and options, then the KitchenAid is a great option, especially for those who will be working with very dense foods. If you do not mind the higher price point and want top-quality materials, then the Breville (#4) is the way to go! 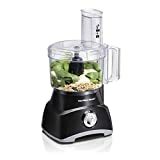 But if at the end of the day, you just want a simple food processor for not a lot of money, then the Black & Decker model (#5) will satisfy. Whatever your food processor needs, these top 5 models will give you what you’re looking for to cut down on that cooking time! Listing motor wattage is a best a very tricky item and can be subject to major misinterpretation. A motor draws maximum wattage when the motor is stalled, and of course nobody really cares about the stall wattage. If any of these motors actually dissipated the listed wattages they’d burn up in a few seconds. Think about the 1200 watt model, then think about your 1200 watt hair dryer. That dryer blows enormous amounts of air and even so gets really, really hot (which is good if you’re drying hair, but not so good if you’re running a food processor.) I’m guessing that the wattages listed are nothing more than the stall wattages and not really very significant comparisons. That might well explain why you don’t see much performance difference between the 1200 watt and the 720 watt models. Probably very similar motors with different methods of measuring peak (stall) current draw. The watt ratings for motors are a significant and reliable indication of the performance you can expect from a motor – any motor, period. …thought I could add this to my comment, but couldn’t, sorry for the second post. Thank you very much for the wonderful article on food processors. At 83, and a lifelong cook, I love being I. The kitchen. However, my hands are not so flexible now, and my feet certainly do not like standing so long in one place while I chop, grind, and otherwise prepare raw foods for cooking or making salads. Now I am interested in some of the time- and work-saving appliances out there. You have helped me decide which processor will help the most! Thanks again, Elizabeth Martin. Read Next: What Are The Best Food Processors For Baby Food In 2018? What Are The Best Blenders for Smoothies in 2018?